If you’re experiencing pain from nerve-related conditions, Integrative Chiropractic offers a noninvasive, safe and efficient option to help you heal. 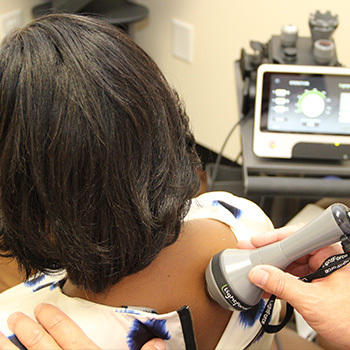 With our deep tissue laser, an infrared beam focuses on a specific area and penetrates deeply into the tissues. When you first visit our office, we’ll ask questions to find out more about your concerns and level of health. After your case has been evaluated, we’ll discuss our recommendations with you. If the cold laser is a part of your plan, we’ll start with you sitting or lying in a comfortable position depending on the area of focus. The laser may feel slightly warm but won’t cause discomfort. The session lasts just a few minutes, and you might feel relaxed, though there aren’t other side effects. We’ll then talk to you about future treatments that may be necessary. Contact us today to book your appointment or to learn more about our multidisciplinary approach to health care!